If present-day electoral politics strike you as disreputable, take comfort in the knowledge that the Republic has survived its share of low-down, brass-knuckle campaigns in the past. The presidential election of 1828 might have been the very dirtiest. This race pitted incumbent John Quincy Adams, the silver-spoon New Englander and son of Federalist founding father John Adams, against Andrew Jackson, the uncouth self-made westerner of Scotch peasant stock. Jackson was [in]famous for his duels, and his willingness to push the envelope on acceptable use of the military forces he commanded. Some foes saw him as an American Napoleon; some supporters, likewise. One of the juiciest gobs of slung mud in that 1828 campaign involved Jackson’s actions as a Major General during the War of 1812, and specifically right around the Battle of New Orleans. At any rate, back in 1815, when army regulars were engaged on the east coast (or in the quixotic attempt to invade Canada), battle in the south and west pitted shaky American militia against British-allied Indian tribes in dirty, bloody ethnic cleansing. Immediately prior to New Orleans, Jackson, west Tennessee’s biggest landowner and therefore its militia commander, took his forces south to Alabama, combined them with other militia, and routed the Creek, ending the Creek War subplot to the War of 1812. ‘Twas this conquest gave Jackson his “Old Hickory” nickname for controlling the Muscogee Creeks of Hickory Ground. Cool beans for A.J., but not everyone on his team was equally excited. After the Creek surrendered at the newly-raised Fort Jackson — vanity, vanity, all is vanity! — a number of soldiers stationed there with the 1st Regiment West Tennessee Militia started agitating to pack up and leave, even with the British navy still lurking. Come September, some even went so far as to demonstratively tramp out of Fort Jackson, vowing to return to hearth and home. These were not enlisted soldiers of a standing army, so they did not necessarily conceive themselves bound to fight the British in Louisiana or the Creeks in Alabama: rights and obligations and loyalties were still being sorted out in the young Republic. These deserters had, however, been mustered that June for an announced six-month term, and September was only three months later. Moreover, these weren’t the only rumblings of desertion in Jackson’s ambit, and since he was potentially facing the prospect of defending the whole Gulf Coast against the world’s preeminent military power using nothing but a motley collection of farmers, Indian allies, pirates, and what-have-you, Old Hickory was not inclined to countenance anything that could erode his forces’ tenuous unity. Like George Washington before him, Jackson shot some malcontents today to pre-empt trouble tomorrow. On November 21, 1814, Jackson ordered the six deserters/mutineers to court-martial. The next day, he departed to New Orleans where he would cover himself with glory. After winning that battle, Jackson adjudicated a message from the Alabama court-martial, announcing six men condemned who had not been recommended for leniency. So Jackson behaved just as if he had a going conflict on his hands and sent back confirmation of the sentences. His six mutineers were shot kneeling on their coffins before 1,500 troops in Mobile, Ala. on February 21, 1815. Only after that did everybody (British included) find out that there wasn’t anything left to fight for. But when Andrew Jackson eventually ran for U.S. President in 1828, the poor militiamen were exhumed (only metaphorically!) to traduce the general, whose reputation already ran to the bloodthirsty. This was a country where a great many of the men casting ballots would be, actually or potentially, subject to militia duty: the prospect of a frontier Queeg actually executing militia was calculated to impair Jackson’s famous appeal to the common man and raise the specter of the president as a potential strongman. 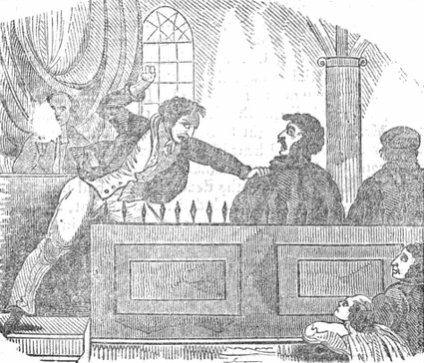 Propaganda pamphlets circulated this execution story widely that year, the swiftboating of the 19th century. 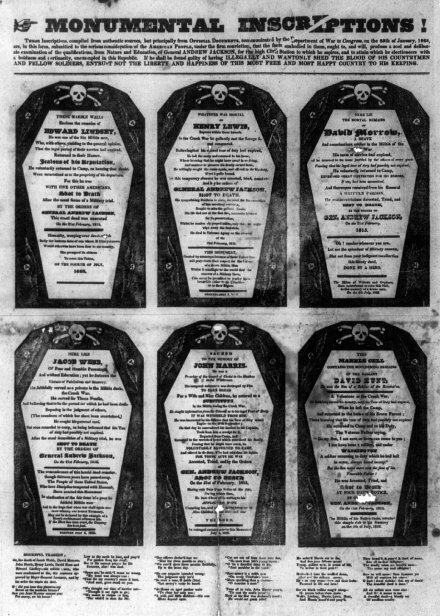 Their inevitable inclusion of six coffin-shaped blocks to symbolize the dead men this date eventually gave to anti-Jackson broadsides the name “Coffin Handbills” — a term that eventually extended to the entire genre of political libels. This linguistic relic is surely due for a bicentennial resurrection. Irony or no, the attacks had to be dealt with. The corps to which the ‘six militiamen’ belonged, was stationed at Fort Jackson. Between the 10th and 20th of September 1814, before the period even of three months, much less six months, had expired, an alarming mutiny, such as was seldom ever witnessed in any army, took place in the camp, of which these ‘six militia men’ were the ringleaders. Harris who seems to have been the principal, several days before the mutiny broke out, carried about a subscription paper thro’ the camp, obtaining the signatures of all who would agree to go home. In defiance of their officers commanding the post, they on the 19th of September 1814, violently and tumultuously assembled together, to the number of near two hundred, broke open the public stores, took out provisions, demolished the bake house, shot down breves, and in the face of authority, left the camp on the next morning ‘at the end of revielle beat;’ yelling and firing scattering guns as they departed, proclaiming to all who would, to follow them. Th proceedings of the court martial were forwarded to General Jackson then at New Orleans, for his approval. The six ringleaders were not recommended to mercy by the court martial. No palliating circumstances existed in their case, known to him. He knew they had been tried by a court martial composed of their fellow citizens and neighbours at home. The news of peace had not then arrived. The enemy’s forces were still in our waters and on our border. When an attack might be made was unknown, and the militia under General Winchester‘s command at Mobile, were ‘threatening to mutiny.’ … General Jackson saw that the salvation of the country was still in jeopardy, if subordination was not preserved in the army. He approved the sentence, and these six unfortunate, tho’ guilty men, were executed. This approval of the sentence of the court martial was made at New Orleans on the 22d of January, 1815. The first intimation which the General had of the news of peace even by rumour, was received on the 18th or 19th of February, 1815 … Col. G.C. Russell, who commanded on the day the sentence of the court martial was carried into execution, states in a letter of the 29th of July, 1827, that ‘we had no knowledge of a treaty of peace having been signed at Ghent, till more than a month after the approval of the sentence, and fifteen or twenty days after its execution.’ The official news of peace did not reach General Jackson until the 18th of March, 1815, and on the 19th of the same month, the British commander received the official intelligence from his government. It was not until after this period that the British forces left their position on that border of the union. The effect which the execution of these men produced in the army was most salutary. Not a whisper was afterwards heard of the mutiny which had threatened General Winchester’s command. Subordination was restored, and all the troops in the service were willing, and did without a murmur perform their duty. Mutiny and desertion were no longer heard of in that part of the military service. it is impossible to conceive how censure can attach to General Jackson. At the time he approved the sentence of the six ringleaders, he pardoned all those who had been recommended to mercy by the court martial that tried them. At the time of the execution all acquiesced in its justice. Every officer in the army responded to the importance of the example, for the good of the service. At that time the whole country was satisfied. Not a whisper of censure was heard against the commanding General, or any member of the court martial in reference to it. Polk, indeed, advised his friend Jackson closely during the latter’s 1828 campaign, and specifically counseled an active campaign to rebut the “six militiamen” attacks. Polk’s energetic response and others like it must have worked well enough: Jackson crushed John Quincy Adams as handily as he had once done the Creeks, and wound up with his hatchet face on the American $20 bill. * The De Tocqueville quote in the text is the part germane to this post, but it disdainfully goes on to pronounce New Orleans “a victory which was, however, a very ordinary achievement and which could only be remembered in a country where battles are rare. Now the people who are thus carried away by the illusions of glory are unquestionably the most cold and calculating, the most unmilitary, if I may so speak, and the most prosaic of all the nations of the earth.” Sniff. ** And to follow Jackson’s policy of dubious southerly land-grabs. On this day in 1815, eight young men condemned for desertion during the War of 1812 were executed by firing squad in Nashville, Tennessee. They were brought out to be shot one by one, as there weren’t enough people available to form a firing squad large enough for the group of them. The desertion rate for American soldiers in the War of 1812 was 12.7%, according to available service records. Desertion was especially common in 1814, when enlistment bonuses were increased from $16 to $124, inducing many men to desert one unit and enlist in another to get two bonuses. We’re not sure how well these eight got paid off in life … only that they collected their last check in lead. Nathaniel Chester, age unknown, a member of the Corp of Artillery. Benjamin Harris, 38, a private in the 44th Regiment. Born in Virginia and raised in New Orleans, Louisiana, he enlisted on March 26, 1814 and deserted on July 1. John Jones, 33, a private in the 2nd Rifle Regiment. He’d enlisted for a five-year stint on July 25, 1814 in Farquier, Virginia. The date he deserted has not been recorded. Jacob King, 20, a private in the 1st U.S. Artillery. He was born in Pennsylvania and enlisted on March 28, 1814 for five years. He deserted on July 12. James McBride, 21, a native of Virginia. Records about his military service are unclear: some reports are that he enlisted on April 20, 1813, and other accounts give the date as July 22, 1814. It’s possible he deserted twice; this was a common practice, as noted above. William Myers, 19, a private from Georgia. He enlisted on March 27, 1814; it’s unknown when he deserted. Drury Puckett, 36, a member of the 2nd Infantry. (Almost certainly the son and namesake of this Drury Puckett.) Like Harris and McBride, he was from Virginia and he had enlisted there for five years on September 24, 1814. The record says he deserted on December 31, but this is surely in error, because by then he had already been sentenced to die. John Young, age unknown, from Winchester, Virginia. He enlisted on October 3, 1814 and deserted after a mere five days. General (and future President) Andrew Jackson affirmed their sentences on January 28, pardoning five others at the same time. This was twenty days after Jackson fought the Battle of New Orleans, the final major conflict in the war. This day’s event was the largest mass execution in Tennessee history. 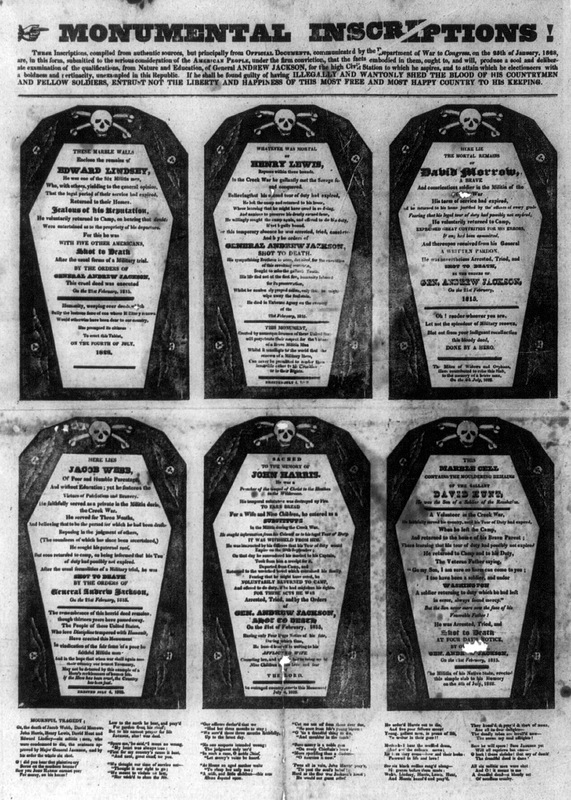 On this date in 1835, four Spanish pirates — it was supposed to be more — were put to death at Boston. Gilbert and his crew of forty or so souls — Spaniards, Portuguese, South Americans, half-castes, and at least one west African — waylaid the Salem, Mass. brig Mexican. After hours ransacking the ship, relieving it of $20,000 in silver, the raiders locked the crew of their prize below decks and put the Mexican to the torch. After the Panda departed, those imprisoned unfortunates managed to break out of the death trap in time to control the blaze and return to port. The incident thereby reported, the Panda would in due time be cornered off the African coast and sunk by a British ship. 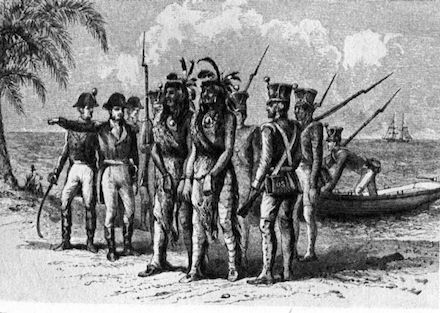 A dozen of the salty brigands fished out of the sea were eventually extradited to the U.S. for an eventful fourteen-day trial. One of the crew of the Mexican, called upon to identify a member of the pirate crew who tried to drown him in a burning ship, strikes the accused corsair. A defense lawyer laboring mightily in a half-lost cause managed to procure not-guilty verdicts for five of the crew on grounds of superior orders. The cabin boy (15 at the time of the raid) and the aforementioned west African were among these men spared. The four who hanged today — Pedro Gilbert, Juan Montenegro, Manuel Castillo, and Angel Garcia — were meant to have been seven. Two of the seven received stays of execution; we’ll return to them in a moment. The other man in the condemned party, Manuel Boyga, cheated his executioner, kind of, by exploiting a guard’s momentary inattentiveness to slash open his own carotid artery with a sharp bit of tin. He bled out too quickly for his executioners to “help” him, but because this efficient (near-? )suicide occurred immediately before the hanging, Boyga’s unconscious form was still borne in a chair to the scaffold and hung along with his four quick mates, just to make sure. Boyga might well have been dead already; if not, the hanging only hastened his demise by moments. As to the other two: the ship’s carpenter Francisco Ruiz, it was thought, might have been crazy. 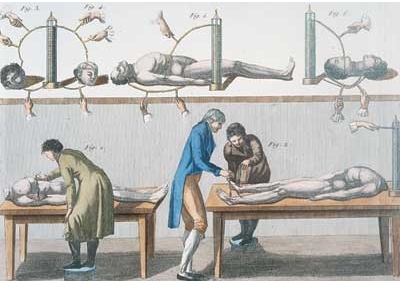 But the Spanish-speaking physicians who eventually examined him would pronounce his ravings a simulation; he was accordingly hanged in a follow-up execution on September 12, 1835. The last man was Bernardo de Soto, the first mate and the owner of the Panda. De Soto’s pretty black-eyed wife back home caught wind of her man’s fate and made the Atlantic crossing to comfort her husband in prison … and to prostrate herself before the U.S. president Andrew Jackson who had the final say for clemency in this federal case. Duly smitten by this pleasing romantic flourish, Jackson did better than merely sparing de Soto’s life: he gave the condemned pirate a free pardon on July 6, 1835. * Gilbert’s Bar today has the last remaining “House of Refuge”, once one of several standing 19th century encampments built to shelter any wayfarer who shipwrecked in the vicinity.